Caption slip reads: "Photographer: Brunk. Date: 1958-12-06. Assignment: W.L.A. Leaper, UCLA Med. Cen. Mrs. Florence Flores sobs as she trys [sic] to comfort her husband, John R. Flores, 44, who leaped from the third story window of the Beverly Hills Doctors Hospital. Also in picture is Miss Sylvia Salynuik, R.N. of the UCLA Med. Cen. Miss Sylvia Salynuik, R.N. 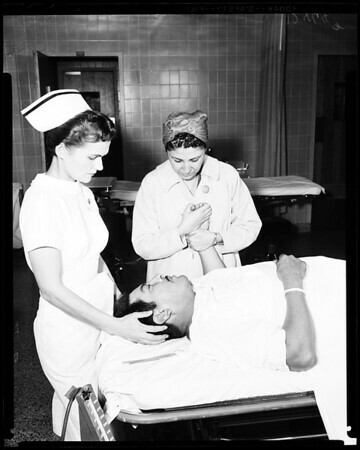 of the UCLA Medical Center, comforts Mrs. Florence Flores after telling her the extent of her husband's injuries. John R. Flores, 44, leaped from the third story window of the Beverly Hills Doctors Hospital and suffered multiple fractures of both heels and his neck".